Utilizing a “Universal Socket Design” with ultra-high molecular weight polyethylene material, the novel Mercer Universal Prosthetic (MUP) aims to provide an individual, adjustable, and comfortable option for low-income Vietnamese patients. Thus far, there have been no clinical trials or studies on the functional aspects of the device. The following article assesses the functionality of the prosthesis while serving as a stimulus for further research, such that design and functionality improvements can continue to be made. The study was conducted in three rural Vietnamese clinics, with 57 participants. The effectiveness of the MUP was compared to the patient’s original prosthetic (Old P) in terms of gait mechanics using PRO.Vision 2D software. Specifically, total knee and hip angle range of motion (ROM), percentage stance phase and swing phases, and individual knee and hip angle ROM for each phase of the gait cycle were assessed and compared. No significant differences regarding overall percentage stance or swing phase, knee angle ROM, or hip angle ROM were found between the prosthetic types. However, certain individual phases of the gait cycle showed significant increases in knee and hip angle ROM with the MUP as compared to the Old P, possibly attributable to the lightweight property of the MUP. Ultimately, no overall difference was found between the gait mechanics of the Old P and the MUP. This suggests the MUP as an affordable, cost-effective prosthetic alternative. The Mercer on Mission Vietnam Orthopedic and Prosthetic Clinic Program is a Clinton Global Initiative recognized non-governmental organization (NGO) that aims to improve the lives of underprivileged Vietnamese amputees who are exposed to landmines and other forms of trauma in Vietnam. The patients are fit with devices at no cost to them during a 4-week summer program. The program relies on Mercer Universal transtibial prostheses and transfemoral prostheses, which cost approximately $100 (USD) and $150, respectively. In comparison, the cost of custom-designed transtibial prosthetics in the United States ranges from $4,000 to $10,000 . In the developing world, there is an increased need for affordable yet functional prosthetic devices. For example, surveys in India revealed that patients prefer to buy devices less than INR 20,000 (roughly $287.00), which are widely unavailable . Novel prosthetic designs have been created to address such needs of underserved populations around the globe. For example, an upper-limb prosthesis has been developed for $20.66, made using a socket composed of Piacava, a renewable resource made from tree bark . In another case, a prosthetic knee prototype design using an early stance lock and a friction damping system has been developed to allow full functional capabilities at both a low metabolic and monetary cost . Additionally, 3D-printed transradial devices estimated to cost around $300 are under development . Furthermore, currently available SATHI transtibial prosthetic devices using polypropylene material cost around $85, providing a light-weight option for many patients . The device studied here, the Mercer Universal Prosthetic (MUP), was originally created to address a specific need amongst underprivileged amputees in rural Vietnam; however, like the aforementioned devices, its ultimate goal is to function as a cost-effective prosthetic that provides a natural fit and mimics the amputee’s natural gait. In general, amputees have been shown to prefer a prosthetic socket that is malleable to residual limb changes, heat, and activity while providing comfort . The Universal socket design of the MUP intends to accommodate a variety of residual limbs, permitting volunteer fitters to individually fit patients (Figure 1). Moreover, the MUP socket design strives to be flexible enough to modulate for a patient’s needs over time . Figure 1. Mercer Universal Prosthetic. Transfemoral (right) and transtibial designs (left). Keeping such design goals in mind, pre-sized manufactured Mercer Universal sockets are constructed from lightweight, ultra-high molecular weight polyethylene (UHMWPE), a material that has been used in devices such as the Jaipur HDPE prosthesis [6,8]. Prosthetics using lighter weight materials have been associated with enhanced gait mechanics, decreased fatigue, and improved physiological energy expenditure in the ambulating patient . UHMWPE allows for socket adjustability—that is, after different length and diameter molds are manufactured for a certain number of socket sizes, a “V-cut” is created along the lateral side of the socket, spanning two-thirds of the socket length [1,8]. This “V-cut” design allows the socket to change circumferential sizes beyond the pre-sized manufactured sockets at any point in time . Thus, as muscle atrophy may ensue in the patient’s residual limb due to non-use, this compressive design aims to promote vascular flow to the residual limb, offsetting possible atrophic effects . Additionally, the Mercer Universal Prosthetic uses a “patellar-bearing design” modeled after the “total-surface bearing design” used in other commercially available products in the West . The patellar-bearing design has frequently been utilized in developing countries, including within the International Committee of the Red Cross prosthetic centers . Unlike the “total-surface bearing design” that is modeled to distribute force equally on the residual limb and reduce pressure on normally pressure-sensitive areas, the “patellar-bearing design” allows pressure to be taken at the patellar tendon, whereby the pressure sensitive distal end of the residual limb is suspended from the bottom and bears no weight . This design intends to be more practical than a total-surface bearing design, which requires frequent follow-ups and subsequent modifications for patients with varying residual limb sizes . Such modifications may lead to a nonfunctional design whereby the forces are no longer evenly distributed but are localized to a pressure sensitive area, leads to pain, pressure ulcers, and sores . In conclusion, the MUP utilizes lightweight material, a “V-cut” design, and a patellar-bearing socket, creating a design that may have improved functional outcomes compared to other devices. Thus far, there have been no studies of the functional performance of the MUP device. Here, we used gait analysis to assess the quality and efficacy of the MUP. Gait analysis is a quantitative method conducted by specialists to test for pathological prosthetic gait and remedy any complications present in the device that may lead to functional gait disturbances . Angle parameters at the hip, knee, and ankle joints are assessed during gait analysis. The gait cycle of each limb consists of two phases: the swing phase and stance phase. The stance phase is characterized by the following periods: heel strike, loading response, midstance, terminal stance, and pre-swing. Heel strike is the initial contact one heel creates with the ground. When the sole of the foot meets the ground, the weight of the body is shifted onto that limb, characterizing the loading response. The tibia sequentially rotates over the stationary foot in the direction of locomotion, marking the beginning of the midstance phase . The onset of terminal stance occurs once the weight from the hind and midfoot regions transfers to regions of the forefoot. Next, in pre-swing, the weight from the limb transfers to the contralateral limb . The swing phase is characterized by the following periods: initial swing, midswing, and terminal swing. Initial swing occurs from toe-off up until the limb is directly opposite the contralateral limb. Midswing follows until the tibia of the limb is vertically oriented . Finally, terminal swing follows until heel-strike for the next stride occurs, and the cycle continues. This study was approved by the Institutional Review Board (IRB) and Office of Research Compliance at Mercer University in Macon, Georgia on August 22, 2016 (NHMC #H0606821). 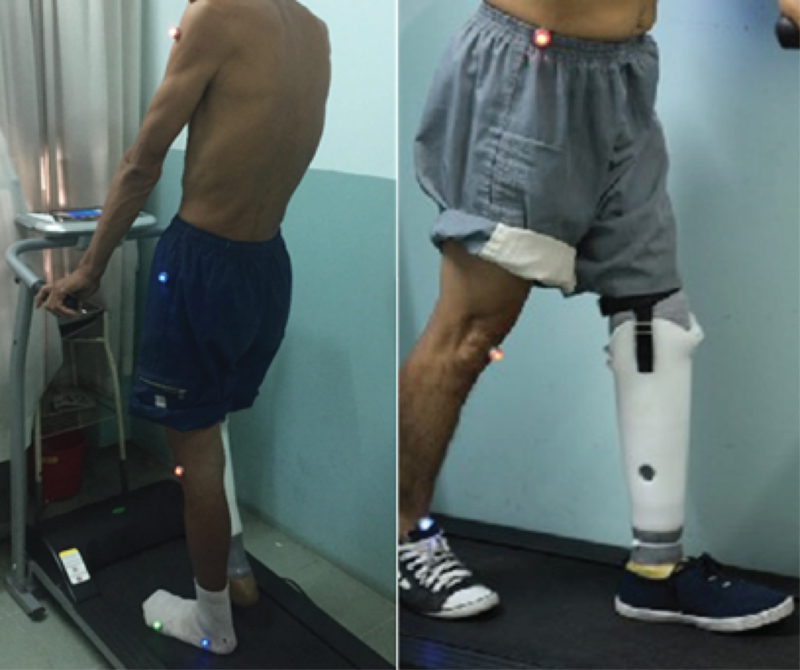 721 patients from rural areas in Vietnam were fitted with Mercer Universal transfemoral and transtibial prostheses over a 4-week period during the summer of 2017 via the Mercer on Mission program, at no cost to the patients. The fittings took place at one of three clinics set up in the cities of Bến Tre, Bình Phước, and Thái Nguyên. Each clinic consisted of a prosthetic fitting center and a gait analysis center. 57 of the 721 patients met our study’s inclusion criteria, as reported in Table 1. A space within the clinic was reserved for gait motion analysis. A treadmill was placed against a blank wall to prevent noise disturbance from the computer software, and two cameras were placed at the sagittal planes of the treadmill. After fitting, patients were encouraged to accustom themselves to the prosthetic within the clinic for at least 15 minutes. The protocol was fully described to the patient, and informed consent was verbally obtained. Two-dimensional (2D) gait was analyzed in two planes: sagittal left and sagittal right. A colored LED sensor was placed to assess the sagittal plane of movement at five joints: the knee joint (below posterior convexity of the lateral femoral epicondyle), head of the fifth metatarsal joint, ankle joint (beneath the ankle on a horizontal line to the forefoot marker), shoulder (acromion), and hip (trochanter major). Sagittal Left sensors were placed on the left sagittal plane of the body, while Sagittal Right sensors were placed on the right sagittal plane of the body (Figure 2). Each plane was recorded so that both the natural and prosthetic limb could be assessed during ambulation with their old prosthetic and MUP prosthetic devices. Each patient’s old prosthetic device was vastly different and non-homogenous. Each patient was required to be barefooted and wear fitted clothing for accurate sensor placement. For each patient, the protocol was repeated twice: initially beginning with their own personal prosthetic, and later with their newly fitted MUP. The warm-up time before each recording was neither recorded nor standardized; that is, the patient was recorded with each the device once they felt comfortable enough to walk. The patient was requested to walk on the treadmill using their normal ambulatory ground speed. In conjunction with the patient’s feedback, the examiner set a comfortable walking speed for the patient. This speed remained constant for each plane (sagittal left and sagittal right) and device (MUP and Old P). Figure 2. Gait Motion Analysis Sensor Placement. Left: Sagittal Left. Right: Sagittal Right. Once the patient was comfortable walking on the treadmill, the examiner would start recording using the PRO.Vision software. Cameras sensed the different movements and colors and transmitted the information to the software on the computer. 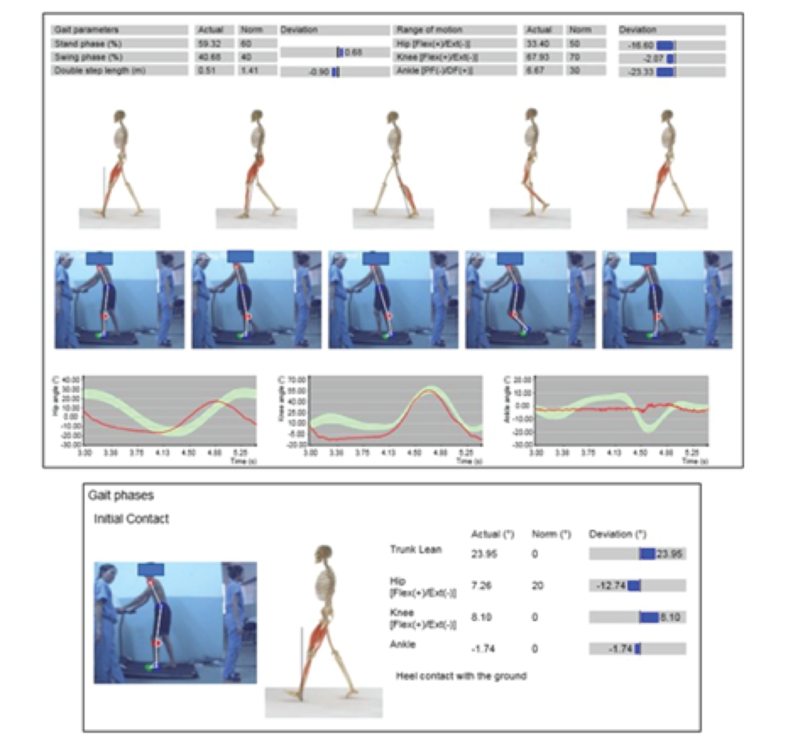 The real-time gait motion analysis system generated a 2D composite of the patient during running or walking. Each recording lasted three gait cycles. The PRO.Vision software allowed complete assessment of gait motion and comparison of gait to a healthy reference population. The measurements were created using the software, where the examiner identified each phase of the gait cycle on the recorded video. The software system captured the LED lights to produce various measurements during the length of one gait cycle. Each patient was recorded three times; a PDF report was obtained on each recording and subsequently averaged to produce the overall score (Figure 3). Upon analysis, only 34 reports out of the 57 reports were studied due to technical disturbances with the camera recording or the PRO.Vision software. After creation of the PDF reports, two angular parameters, hip angle and knee angle, were specifically assessed per patient. The ankle angle was not included in this analysis, as many patients’ old prosthetic devices did not contain a foot device; therefore, we were unable to include any meaningful differences in our analysis. Figure 3. Example report produced by PRO.Vision. The following parameters for the patient sample (n = 34) were averaged: percentage (%) spent in stance phase, percentage (%) spent in swing phase, overall knee ROM (◦), overall hip ROM (◦), individual knee ROM for each phase of the gait cycle, and individual hip ROM for each phase of the gait cycle (◦). Each of these parameters was compared between 2 different sets of groups: (1) the old prosthetic-wearing natural limb (Old Natural) and the MUP-wearing natural limb (MUP Natural) and (2) the old-prosthetic limb and the MUP prosthetic limb. Comparisons and sequential statistical testing were completed to assess for any meaningful differences in gait parameters between the MUP and Old P on either the prosthetic and/or natural limbs. Since the range of Old P devices from the patient sample population was vastly non-homogenous, statistical testing using a paired sample t-test was used to assess the data. 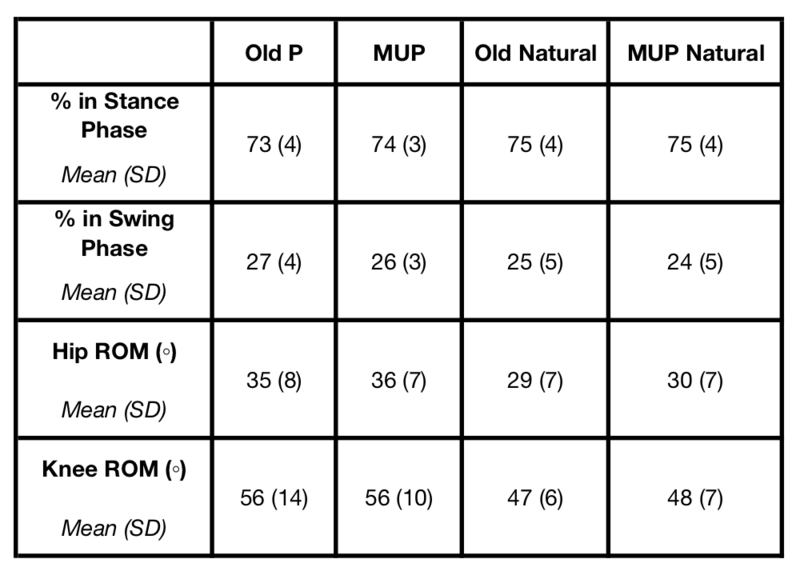 No statistically significant differences were found between the mean percentage patients spent in the stance and swing phase between the Old P and MUP, or between the natural limb with the old prosthetic (Old Natural) or natural limb with the MUP (MUP natural) (Table 2). Additionally, no statistically significant differences were evident between mean total ROMs at the knee between the Old P and MUP, or the old natural and MUP natural (Table 2). A significant difference in the mean total ROM at the hip was found between the MUP natural and Old natural (p = 0.031), while no significant differences were found between the Old P and MUP at the hip. Table 2. Gait comparison. Shows average % time patients spent in stance phase or swing phase and overall patient hip and knee ROM during one gait cycle. Average angles at the knee joint were plotted over the eight phases of the gait cycle (Figure 4). 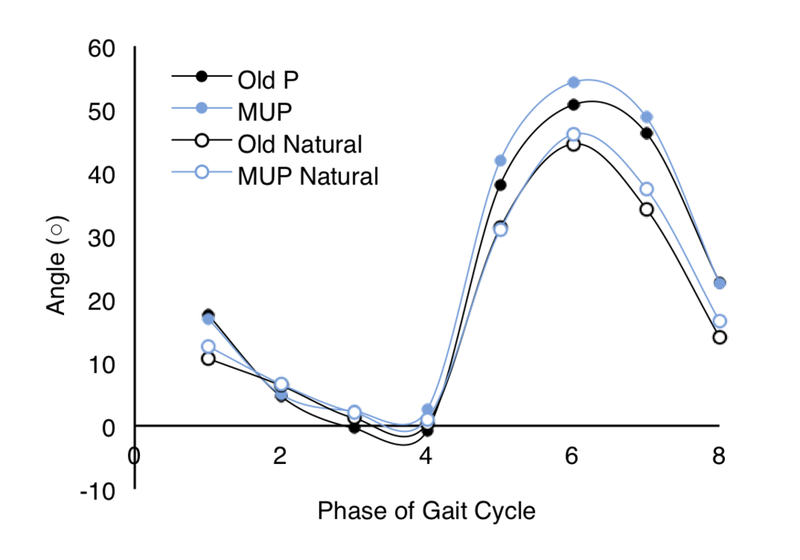 With respect to knee angles, statistically significant differences were found between the Old P and MUP in phases 3 (mid-stance) (p = 0.027), 4 (terminal-stance) (p = 0.008), and 6 (initial swing) (p = 0.045) of the gait cycle, while such a difference was only evident in phase 7 (mid-swing) (p = 0.042) between the Old Natural and MUP Natural groups (Table 2). Figure 4. Average knee angles during one gait cycle. Depicts four different parameters (Old P, MUP, Old Natural, MUP Natural) over each phase of one gait cycle (1–8). 1: initial contact; 2: loading response, 3: mid-stance, 4: terminal-stance, 5: pre-swing, 6: initial swing, 7: mid-swing, 8: terminal swing. Next, average angles at the hip joint were plotted over the eight phases of the gait cycle (Figure 5). The same four parameters were assessed and compared. Statistically significant differences were found in average angles between the Old P and MUP groups in phases 1 (initial contact) (p ≤ 0.001), 5 (pre-swing) (p = 0.003), 6 (initial swing) (p = 0.003), 7 (mid-swing) (p ≤ 0.001), and 8 (terminal swing) (p ≤ 0.001). The results were similar with respect to the old natural limb and MUP natural limb groups, where statistically significant differences were evident in phases 1 (initial contact), 5 (pre-swing), 6 (initial swing), 7 (mid-swing), and 8 (terminal swing) (p ≤ 0.001 for all). In Vietnam, the commercial cost of prosthetic devices is often prohibitively high. Here, we tested the effectiveness of a cost-effective alternative, the Mercer Universal Prosthetic (MUP), by conducting gait analysis. We found that MUP devices functioned similarly to existing devices; that is, we found no statistically differences with respect to mean % spent in swing phase and mean % spent in stance phase or total hip and total knee angle ROM for both prostheses. Therefore, the MUP does not alter the patient’s gait drastically and provides the patient with a similar gait pattern that they are already used to. By enabling a similar overall gait pattern, the MUP provides an easy transition from wearing the Old P, as the patient is better accustomed to a device which mimics the overall functionality of their old prosthetic. Figure 5. Average hip angles during one gait cycle. Depicts four different parameters (Old P, MUP, Old Natural, MUP Natural) over each phase of one gait cycle (1–8). 1: initial contact; 2: loading response, 3: mid-stance, 4: terminal-stance, 5: pre-swing, 6: initial swing, 7: mid-swing, 8: terminal swing. Hence, the MUP functions at least at the minimal standards set in place by the patient’s older prosthetic. In fact, in some areas the MUP may function better. When specifically evaluating average knee angle ROM during each phase of the gait cycle, a statistically significant difference between the MUP and Old P in mid-stance, terminal stance, and initial swing phases was calculated. The MUP device achieved greater knee angle ROM at these phases compared to the Old P. We attribute the increased knee angle ROM of the MUP to be due to the MUP’s lightweight polyethylene material (average weight: 1.23 ± 0.3 kg). The increased knee ROM provided by MUP provides greater movement during the last stages of the stance and initial stages of the swing phase. Additionally, a statistically significant difference between knee angle ROM of the Old Natural limb and MUP natural limb was found in mid-swing. We similarly attribute this increase in ROM to the lightweight material of the MUP. When specifically evaluating the average hip angle ROM during each phase of the gait cycle, a statistically significant difference between the MUP and Old P as well as the Old Natural limb and MUP natural limb was calculated during initial contact, pre-swing, initial swing, mid-swing, and terminal swing. The MUP device could achieve greater hip angle ROM at these three phases compared to the Old P. Additionally, a statistically significant difference between the total hip ROM in the Old Natural limb and MUP natural limb was found. We attribute both the increased hip angle ROM of the MUP at the specific phases and the increased total hip ROM in the natural limb to the MUP’s lightweight material. The swing phase at the hip is particularly inferred to be influenced by the polyethylene material, providing the patient with an improved ROM during individual phases. The small sample size (n = 34) is a limitation of this study; in follow-up studies, we hope to increase the sample size to provide a larger representation of patient’s older prosthetic devices while comparing them to the MUP. Additionally, a brief time interval was designated between fitting the prosthetic and beginning the gait study, possibly preventing patients from becoming adequately accustomed to the MUP during the analysis. In future studies, a longer time interval will be designated to allow the patient adequate time to become accustomed to the MUP, and the warm-up time between each recording will be standardized. Additionally, the design and functional characteristics (weight, material, cost, socket design) of the patient’s Old P will be recorded to better categorize similarities and differences between the Old P and MUP devices. Further assessments including the patients’ self-reported assessment of their comfort level, ROM and overall movement, and likelihood of adoption or continuation will be conducted. In summary, the MUP provides a similar overall gait pattern compared to other prosthetic devices available in Vietnam. In some areas of the gait cycle, the MUP may provide improved gait function. Although there were no statistically significant differences between overall hip and knee angle ROM, individual differences within individual gait cycle phases demonstrated the potential for the MUP to provide a greater ROM compared to other devices. This study was the first clinical research investigation of the MUP device, and we aim to continue further work to modify the device and its functionality to reach our goal of improving the lives of underprivileged amputees around the globe. Vo HV, Nguyen BN, Le TT, McMahan CT, O’Brien EM, Kunz RK (2016) The Novel Design of Mercer Universal Prosthesis. 6th International Conference on the Development of Biomedical Engineering in Vietnam (BME6), Ho Chi Minh City, Vietnam. 63:197–204. Nagaraja V, Bergmann J, Sen D, Thompson M (2016) Examining the needs of affordable upper limb prosthetic users in India: A questionnaire-based survey. Technology & Disability. 28(3):101–110. Jackson S, Volk V, Prosise J (2017) Novel Design for a Simple and Affordable End-Effector for an Upper-Limb Prosthesis. International Journal For Service Learning In Engineering. 12(1):62–73. Murthy Arelekatti VN and Winter AG (2018) Design and Preliminary Field Validation of a Fully Passive Prosthetic Knee Mechanism for Users With Transfemoral Amputation in India. ASME J Mechanisms Robotics. 10(3):031007–8. Gretsch K, Lather H, Peddada K, Deeken C, Wall L, Goldfarb C (2016) Development of novel 3D-printed robotic prosthetic for transradial amputees. Prosthet Orthot Int. 40(3):400–3. Andrysek J (2010) Lower-limb prosthetic technologies in the developing world: A review of literature from 1994–2010. Prosthet Orthot Int. 34(4):378-398. Safari MR and Meier MR (2015) Systematic review of effects of current transtibial prosthetic socket designs—Part 2: Quantitative outcomes. J Rehabil Res Dev. 52(5):509–26. Khan A and Vo HV (2014) Novel Design Of A Prosthetic Foot Using Spring Mechanism. In: 5th International Conference on Biomedical Engineering in Vietnam, Ho Chi Minh City, Vietnam. 46:503–506. Lusardi MM, Jorge M, and Nielsen CC (2013) Orthotics and Prosthetics in Rehabilitation, 3rd ed. 697–735. Laing S, Lee P, Lythgo N, Lavranos J (2017) Transtibial Prosthetic Socket Shape in a Developing Country: A study to compare initial outcomes in Pressure Cast hydrostatic and Patella Tendon Bearing designs. Gait Posture. 58:363–368. Esquenazi A (2014) Gait Analysis in Lower-Limb Amputation and Prosthetic Rehabilitation. Phys Med Rehabil Clin N Am. 25(1):153–167. Nordin M and Frankel VH (2012) Basic biomechanics of the musculoskeletal system, 4th ed. 430–445.